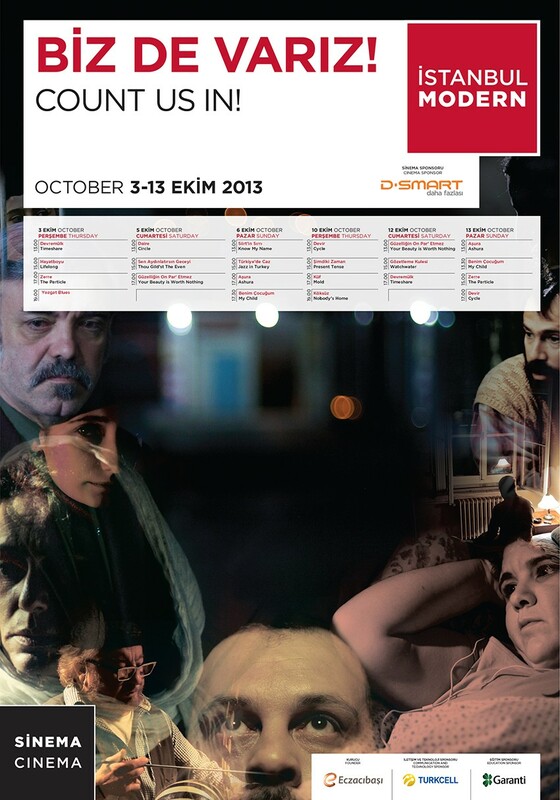 Istanbul Modern Cinema presents a program of new Turkish cinema: Count Us In! The films in the program, released in the past two years, have made a mark, have aroused interest in Turkey or abroad, won awards at festivals, but did not enjoy a theatrical release or at least a wide one. Introducing new characters and new representations of identity, and adding new social approaches to Turkish cinema, which has developed considerably over the last 20 years, these films constitute a multivoiced selection by offering a place to the “other” in society. Consisting of a total of 16 films, the selection includes feature-length films as well as Köken Ergun’s short Aşura which competed for the Golden Bear at this year’s Berlin Film Festival and won the DAAD Short Film Prize. Directors and cast members will also be in attendance at the screenings. There are approximately 1 million Ja’fari Shiites in Turkey. Every year in the month of Muharram, the Ja’fari Community in Istanbul holds an Ashura ceremony during which they also perform a play reenacting the Karbala tragedy. The film, which also shows some emotional moments from the rehearsals, won the German Academic ExchangeProgram’s Short Film Prize at the 63rd Berlinale. This documentary takes place in the homes of five different families in Turkey and tells the story of lesbian, gay, bisexual, and trans individuals through the eyes of their parents. All these different stories are joined together through themes such as denial, trauma, helplessness, fear, shame, and acceptance. Having not only accepted their children for who they are, but also having taken the next step to share their experiences, the parents redefine what it means to be an activist in a homophobic society. With a firm and sincere stand in the face of homophobia and transphobia, the documentary shows us the stories of young individuals who derive their strength from their parents’ love. Circle is the tragicomic story of two characters revolving around an unused airport. After having lost his father and his job at the university, Feramus returns from the big city to the country. While dealing with inheritance issues, he begins working at the unused airport. Feramus’s neighbor Betül, a single mom trying to raise her two children by herself, loses her job at the municipal theater and decides to become a body-washer who prepares corpses for funerals. These characters challenge life by conjuring up interesting solutions to extraordinary situations.Atıl İnaç blendstheir unlived love with stories which oscillate between life and death. In his most recent film Derviş Zaim observes the real people of Anatolia and their everyday lives. Turning his camera to Hasanpaşa, a village in the province of Burdur, the director tells about the funny, and sometimes tragic stories of shepherds trapped between their beliefs and the modern world. Every year the village holds a shepherding contest in which, according to tradition, the fleeces of sheep are died red with a powder dye obtained by sifting fragments of a rock. But that year it has become harder to get hold of the red rock because of the marble quarry opened near the village. Melding documentary and fiction using fantastical elements, the film is notable for its unique narrative language. After her previous film 10 to 11, Pelin Esmer now tells the story of the meeting of two people who avoid others. Nihat has sought refuge as a guard in a watchtower at the top of a remote forest and Seher in a bus station by the highway in Tosya. Both are in a battle with themselves. These two people, whose paths collide at an unexpected time, will henceforth have to fight their battle against guilt together. Directed by Hüseyin Tabak, the film, told from the perspective of 12-year-old Veysel, follows a family which is forced to immigrate to Austria and strives to adapt to the dynamics of a new life. Getting used to a new language and culture in this country is quite hard for Veysel. His only hope in this difficult life is his love for his classmate Ana. Veysel struggles to survive by holding on to this love and his dreams. After declaring his love his dreams come to an end and he has to face the facts of life. The film won six awards at the 49th Antalya Golden Orange Film Festival, including Best Film and Best Screenplay. The film premiered at the Berlin Film Festival and won awards for Best Director and Best Cinematography at the Istanbul Film Festival. The film is the second feature by Aslı Özge who made a promising debut with Men on the Bridge. Ela, one of the main characters, has made herself a name in the contemporary art scene and Can is a successful architect. They share a house designed by Can in one of Istanbul’s prestigious neighborhoods. Despite their unhappy relationship and faded passion Can and Ela take refuge in the comfort of marriage and play a game with themselves and the people around them. While separation could be the solution to all their problems, the couple is caught in an emotional trap and unable to break up. Until one day something happens that will change their relationship. Nobody’s Home tells the story of a family which is not able to survive a sudden loss. After the death of her husband, Nurcan is left alone with three children. When the eldest daughter, Feride assumes the role of the lost father, 17-year-old İlker, the only son who deeply admired his father, quickly grows distant from the family as a reaction to the control Feride has gained. As for the youngest Özge, she is an adolescent and is ignored by her family at a time when she needs them most. Weighed down by the burden of the household, Feride accepts a marriage proposal as an escape, toppling once more the balances in the family. Nobody’s Home earned director Deniz Akçay Katıksız the Seyfi Teoman Best Debut and Radikal People’s Choice awards at the Istanbul Film Festival. Ali Aydın’s first feature, Mold had its world premiere at the Venice Film Festival where it won the Lion of the Future Award. The film follows railroad watchman Basri who doesn’t give up searching for his son who has been missing for years. Seyfi, Basri’s son and only purpose in life, was taken into custody 18 years ago when he was a university student, and no one has heard of him since. For Basri, who cannot get any information from the authorities, his son is neither dead nor alive; he neither exists nor doesn’t. Six years after his son went missing Basri loses his wife. The only hope for this father, who slowly isolates himself from society, are the petitions he keeps writing for his son, whom he wants to believe will return. Shot as a documentary, this film focuses on the life of 16-year-old professional female wrestler Evin Demirhan. Though she supports her family with the money she earns from wrestling, Evin’s older brothers are against her continuing this sport as a profession despite the success she achieved in her own league at the European Championship in 2010. Evin’s goal is to win the World Championship. Evin breasts the difficulties of living as a young girl in Siirt by herself. Her dream is to be able to prevent the bloody events in her city. Like many young individuals in our society today, Mina is jobless, lonely, and unhappy. She wants to break off the bonds with her country and flee to America but she doesn’t have the money to realize this dream. She begins to work as a fortuneteller at a café so she can save up the amount needed and starts distributing people hope about their fate. While merging people with their expectations through the shapes in the coffee grounds, Mina also questions her own present and future. Meanwhile Fazi, the other fortuneteller working at the café, and Tayfun, the owner of the café, have different expectations from her. In this first feature film by Belmin Söylemez, known for her documentaries and shorts, we watch relationships of fate and friendship between people and Mina’s story of escape from the present to the future. A compilation of interviews with 50 doyens of jazz music such as Önder ve Zuhal Foçan, Kerem Görsev, Muvaffak Falay, Herbie Hancock, Can Kozlu, Joe Mardin, Güngör Mimaroğlu, Okay Temiz, İlhan Erşahin, and Cüneyt Sermet,this documentary explores the social conditions, evolution, and interaction of jazz music and its musicians in parallel to the history of Turkey. The work also presents a sociological development process to the viewer. 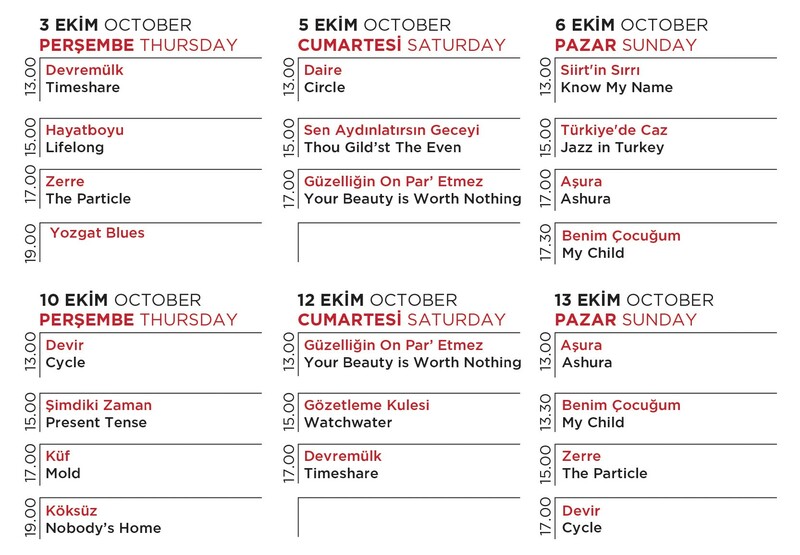 The film is the first documentary to explore the history of jazz in Turkey. In his second feature film Mahmut Fazıl Coşkun, who won the award for Best Film at the Golden Boll Film Festival in Adana this month, turns his camera to the provinces and the story of Yavuz, a music teacher and singer, and his student Neşe. Neşe and Yavuz are offered a job and move to Yozgat. The genre of music the duo performs does not attract much attention even after they meet Sabri who tries to help them out. The relationship between Yavuz, Neşe, and Sabri in this provincial life becomes complicated and their expectations from life and one another starts to change. The Particle is Erdem Tepegöz’s debut feature and earned him four awards at the Golden Orange Film Festival. The film presents a realistic and plain view of the working class. Fighting unemployment like many people, Zeynep struggles to survive in the big city where she lives with her little daughter and mother. Life becomes even more difficult when she is fired from her job at a textile mill. She sets off to work at a new job she has found outside the city. In this new job they all turn out to be crooks. As the camera follows Zeynep throughout the film, directly reflecting her dark world and her daily struggle, the director explores the question of existence through the story of this ordinary human being.